See the full publication on Astro-ph. Synchrotron-emitting radio sources can undergo flaring events that cause dramatic variability in their lightcurves. One of the earliest models for these radio flares describes a cloud of relativistic particles and magnetic fields expanding into a surrounding medium. In this model, at a given frequency, the evolution of the light curve of an expanding cloud is determined by increasing transparency, causing an increase in the flux density, with expansion losses reducing the internal energy. Exponential rise timescale as a function of peak radio luminosity for the entire set of radio flares studied. 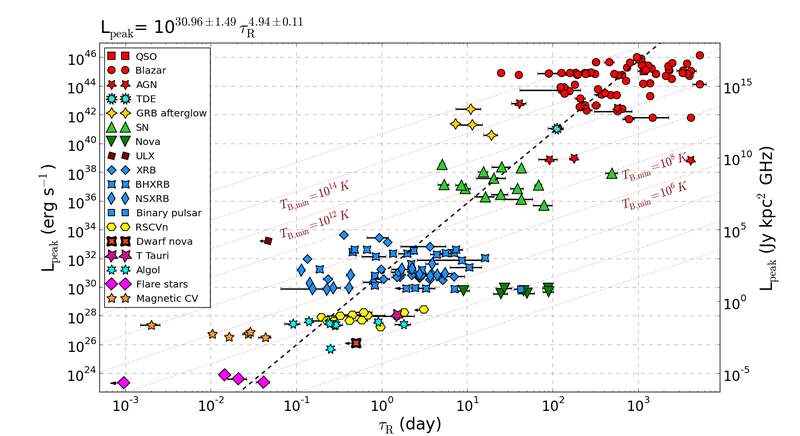 Overplotted are lines corresponding to a fixed minimum brightness temperature (TB,min ), demonstrating that TB,min is an increasing function of luminosity, peaking just above the theoretical limit of 10^12 K for the most luminous AGN. On April 23, 2014, the Swift satellite detected a gamma-ray superflare from the nearby star system DG CVn. This system comprises a M-dwarf binary with extreme properties: it is very young and at least one of the components is a very rapid rotator. The gamma-ray superflare is one of only a handful detected by Swift in a decade. As part of our AMI-LA Rapid Response Mode, ALARRM, we automatically slewed to this target, were taking data at 15 GHz within six minutes of the burst, and detected a bright (~100 mJy) radio flare. This is the earliest detection of bright, prompt, radio emission from a high energy transient ever made with a radio telescope, and is possibly the most luminous incoherent radio flare ever observed from a red dwarf star. X-ray (Swift) and 15 GHz radio (AMI, operating in the ALARRM programme) observations of a superoutburst from the the extreme flare star DG CVn. 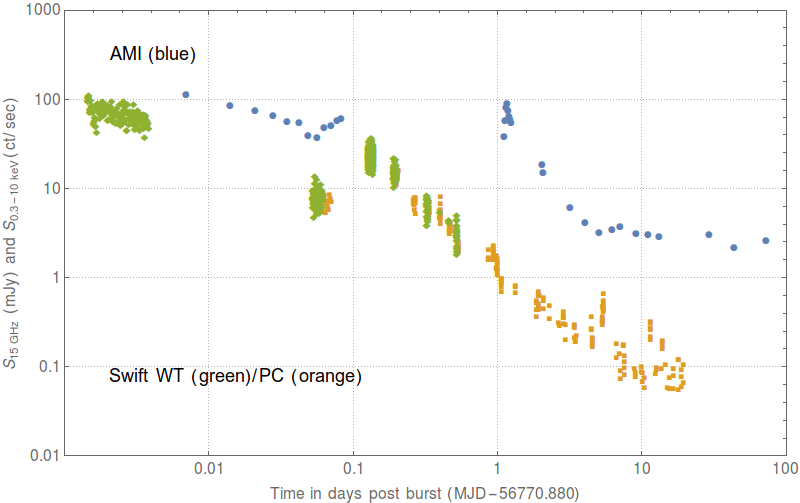 Radio emission was strongly detected already only six minutes after detection of the initial burst by Swift. This demonstrates both the feasibility and scientific potential of very rapid response modes for radio telescopes. 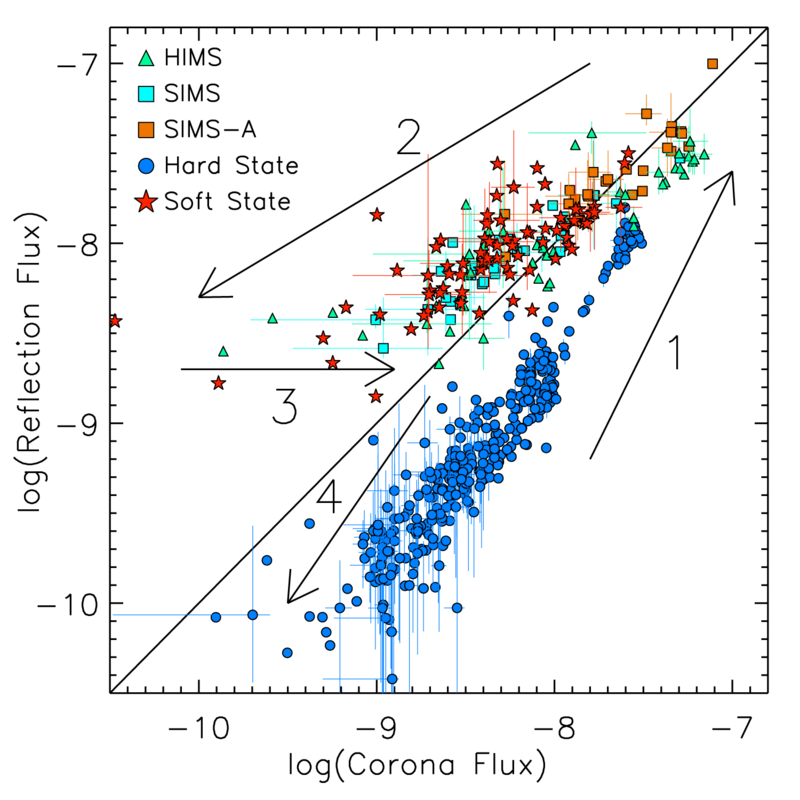 Utilising over 500 (~daily) archival observations of the black hole X-ray binary GX 339-4 with the Rossi X-ray Timing Explorer, we have been able to map out quantitatively how accretion on to a black hole evolves. 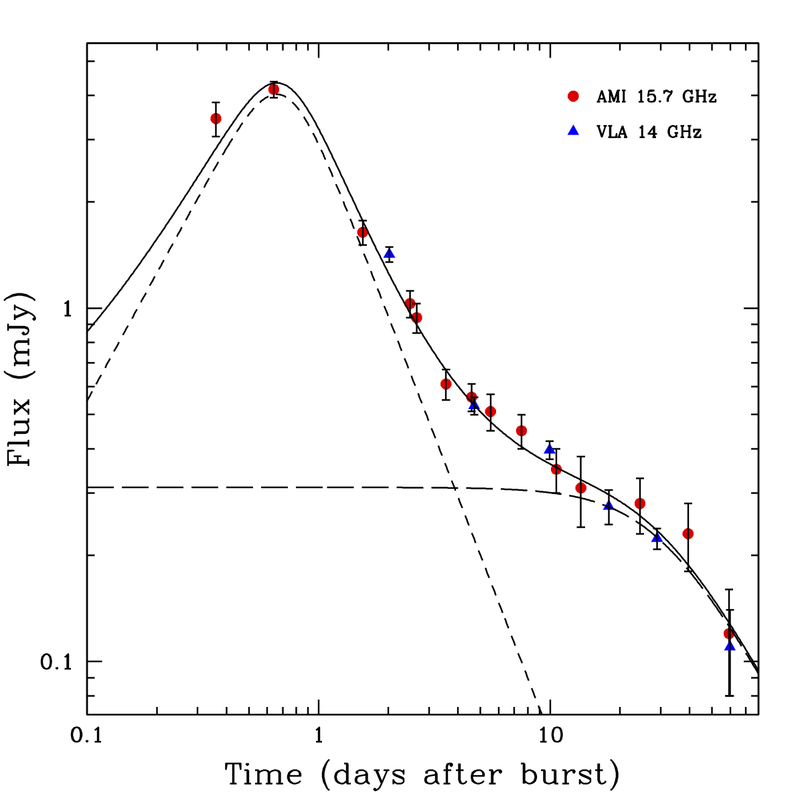 The evolution of the corona and reflection component flux over three outbursts of GX 339-4. Both scales are identical and the solid line indicates one-to-one quantities, thus the hard and soft states are corona and reflection dominated, respectively. Numbered arrows (1-4) illustrate how the source progresses throughout the figure during an outburst. AMI-LA Rapid Response Mode (ALARRM) observations of the nearby bright gamma-ray burst GRB 130427A allowed the 4 Pi Sky team to obtain one of the earliest radio detections of a GRB to date. As soon as this GRB had risen above the horizon the AMI-LA quickly slewed to its position detecting radio emission within 8 hours post-burst. Further follow-up AMI observations showed the radio flux to increase in brightness before rapidly declining one day later. Such a sudden decline in radio emission is very rare and has only been observed from a few GRBs. The AMI 15.7 GHz and VLA 14 GHz light curve of GRB 130427A overplotted with the afterglow model derived by Perley et al. (2014, solid line) showing the individual contributions from the reverse shock (short dashed line) and forward shock (long dashed line). The AMI peak at 16 hrs is one of the earliest radio peaks ever observed from a GRB.